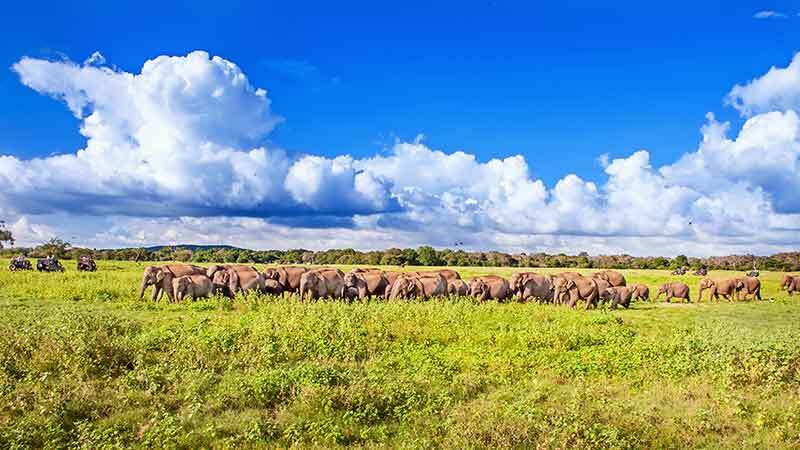 Witnessing the wonder of the mammals of Sri Lanka is a rather inspiring experience for nature lovers. The package is originally designed for 05 nights / 06 days. However, we are always cater to our valuable clients’ requirements and it can be customised for different durations as per request. Pinnawela is situated in the Sabaragamuwa province of Sri Lanka close to Kegalle town. An orphanage, nursery and captive breeding ground for wild Asian elephants is located at this village remarkably known as ‘Pinnawela Elephant Orphanage’. The orphanage has the largest herd of captive elephants in the world and visited daily by many local and foreign tourists. The main attraction is clearly to observe the elephants bathing and feeding which is quite an experience. The orphanage was launched to provide a lifeline to the orphaned baby elephants and adult elephants lost in the wilderness. Minneriya National Park is in the North Central Province of Sri Lanka, around a ten moment drive east from Habarana. Overwhelmed by the man made Minneriya tank, this moderately little stop has an enormous scope of untamed life living in its numerous natural surroundings, including spotted deer, sambar, purple-confronted langur monkeys and macaques, yet it is most well-known for elephant. Amid the dry months, from July to October, the tank is on the “movement” course for these gigantic brutes from a significant number of the encompassing regions as they scan for water and crisp grass, all of which has gone away somewhere else. They accumulate in quantities of up to 300 as of now, starting the biggest meeting of Asian elephants on the planet. Whale watching Eastern drift season in Sri Lanka is from May to Oct, Trincomalee, 257km East of Colombo has turned out to be one of the biggest creature to possess earth. With inhabitant and transitory settlements being spotted off the island’s south west drift, Sri Lanka is quick turning into a top spot to watch Blue Whales, Sperm Whales and Dolphins. COLOMBO…The busiest place in Sri Lanka is Colombo, the commercial capital of the country. Colombo is a beautiful city with modern high rise buildings amidst old colonial ones making it a picturesque place. Galle Face Green in Colombo, the favorite hangout spot for locals and tourists alike overlooking the beautiful Indian Ocean and surrounded by tall beautiful buildings. Viharamaha Devi Park with tall flowering trees which bloom during April is a quiet serene place in the middle of the busy city. Colombo is also a shopper’s paradise with posh shopping malls and the famous Pettah market.